This book is the first of a set of works by the CIDECT, dedicated to the calculation of constructions in hollow profiles, – circular and rectangular – in steel, in the field of structural and mechanical engineering. The continual growth of hollow profile utilisation has led to an intense research activity, in particular during the last twenty years. The CIDECT (Committee International for the Development and the Study of Tubular construction) has contributed extensively to these researches. These years have seen the development of new International and European regulations in the calculation of structures. Thanks to the international activities co-ordinated at the technical level of CIDECT, unified recommendations, concerning tubular structures, have been introduced in most of these regulations. This booklet is dedicated to calculation methods and design procedures of welded and bolted assemblies of circular hollow profiles. The main factors which intervene in the determination of structural capacity of assemblies, are taken into account, for loads considered as static. Computer examples illustrate design procedures and show how one can achieve secure and economic design. The second book of the set of works by the CIDECT under the general title “Construction with Hollow Steel Sections” is dedicated to phenomena of instability: buckling, distortion. Because of the section shape and the particularly favourable distribution of material in cross section, a hollow profile, of circular or rectangular shape, behaves distinctly better than an open profile section under the demands of compression. In remaining within the limits of the relation of the diameter or the width of side divided by the wall thickness, given in this design guide, the local buckling can be disregarded. On the other hand, the resistance to torsion is, in practice, not verified because hollow profiles possess a distinctly larger polar rigidity than open section profiles. While using this book, architects, engineers and constructors will be able to extract to the maximum the advantage of the remarkable properties of hollow profile stability. The computer examples illustrated in the guide permit a better understanding of the topic. This design guide, the third in the set of works by CIDECT under the general title „Construction with Hollow Steel Sections“ is dedicated to the calculation of plane and multi-planar assemblies, welded and bolted, of hollow profiles of either square or rectangular shape. Special attention is paid to the behaviour of assemblies and to the main parameter analysis which govern this behaviour. Recommended calculation formulas are based on simplified analytic models and on many experimental tests. They are accompanied by diagrams and examples in order to help in their understanding. Thanks to the international activities co-ordinated at the technical level of CIDECT, unified recommendations, concerning the design of tubular structures, using rectangular hollow section have been introduced in the new International and European regulations for the calculation of steel constructions. This guide is the fourth in the set of works by CIDECT under the general title „Construction with Hollow Steel Sections“. It is dedicated to fire protection of columns in hollow profiles exposed to fire. One of the major advantages of columns in hollow profiles is to give possible protection against fire without resorting to the addition of classic materials on the external faces of the profiles. In filling the hollow profiles with water or concrete, not only does it allow the reduction of clutter of the columns but one also obtains a cleaner and more elegant solution. The three types of fire protection – external protection with insulating materials or special paints, water cooling, statically or with circulation, and filling with concrete – are described in this book, that contains many examples permitting a better understanding of the topic. One of the main physical properties of a hollow profile is its optimal efficiency in compression, superior to all other structural elements. Filling the hollow profile with concrete increases its structural capacity considerably or, potentially, decreases, for a given load. An excellent resistance to fire is also obtained in this way, without having course to external protection. This aspect is already the object of a precedent dimensioning guide. 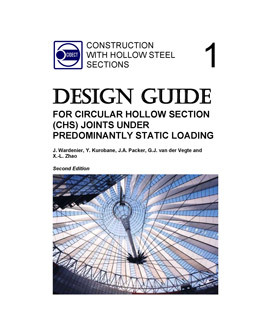 This guide is the fifth in the set of works by CIDECT under the general title „Construction with Hollow Steel Sections“. It is destined to help engineers and businessmen anxious to use concrete filled hollow profiles as pillars, as much in buildings as in bridges, under static loads but also under seismic conditions because these profiles behave remarkably in earthquakes. This sixth manual of the set of works by CIDECT under the general title “Construction with Hollow Steel Sections” is destined to encourage projects and products engineers, inventors and manufacturers to examine the excellent mechanical, architectural and structural qualities of hollow profiles in steel compared to those of the other open sections, and to dedicate a little time to study a project or a product to see if the utilisation of hollow profile in steel would improve techniques and, what is probably more important, would lead to savings. In order to compensate for a specific lack of knowledge in the field of construction in hollow profiles, which is, often the case among mechanical construction engineers, this manual not only offers advice concerning manufacture, assembly and installation, but recommends methods to use for static and fatigue calculations. Above all, this work, contains many examples of constructions in various fields, which will help the reader to understand suitable procedures for the utilisation of these profiles. Thanks to the international co-ordination of researches and the technical projects of the CIDECT (International Committee for the Development and the survey of the Tubular Construction) unified calculation recommendations have been introduced in the International and European codes of dimensioning of structures in circular hollow and rectangular profiles in steel. This seventh manual of the CIDECT collection “Construction with Hollow Steel Sections”, treats the main aspects of manufacture, assembly and installation of structures in hollow profiles, that must be taken into consideration to obtain a secure, economic and architecturally pleasing construction. This manual is designed for architects, estimators and manufacturers to give to each of them a preview and an understanding of the necessary requirements for the economic design of structures using hollow profiles in steel. In all types of constructions, it is essential that these three parties have the same understanding of the whole of the industrial chain. This manual contains technical information on elementary constructive arrangements, methods, of assembly (welding, bolting etc. ), constructive details and their influence on the resistance of the assembly, hot and cold bending, manufacture in factory or on the site, transport, large unit installation. Certain economic aspects which can affect the global cost of the construction are also handled. This is the eight handbook in the CIDECT series “Construction with Hollow Steel Sections” and covers the fatigue design of various types of joints between and connections to hollow steel section members. The fatigue phenomenon is characterised by the progressive degradation of strength under the action of time variant stresses that results in the formation and subsequent growth of cracks, which may eventually lead to fracture of a member or even the collapse of the structure. The fatigue life of a structure depends upon many factors such as: the type of joint, the type of loading, the structural detailing, etc. Several methods, of varying accuracy and complexity, have been developed over the years for the determination of the fatigue life of a structure or structural detail. These methods include the classification method, the punching shear method, the fracture mechanics method, the hot spot stress method, etc. This handbook concentrates mainly on the hot spot stress method, which is widely regarded as one of the most accurate because it can take into account most of the influencing factors. It uses various parametric formulae to calculate the so called ‘hot spot stress’, which in turn is used to determine the fatigue life of the joint under investigation. The fatigue life determination using the much more restrictive and approximate classification method is also included, but in much less detail. This design guide has been written to give the design engineer the information needed to design hollow section column connections in the most efficient and economic way. The guide considers single sided bolted systems,connection classification, simple shear connections, semi-rigid, seismic and rigid connections. Connection to composite conrete filled hollow section columns, splices and bracing and truss connections to hollow columns are also included. The guide is the 9th design guide in the series published under the general heading “Construction with Hollow Steel Sections”. Please type in your Email to receive a download link to the selected Design Guide. © 2019 CIDECT All rights reserved.